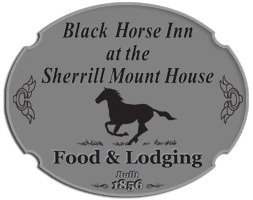 The Black Horse Inn is located on the Great River Road, eight miles north of Dubuque, Iowa. Driving time is approximately 20 minutes. The nearest airport is the Dubuque Airport. The regional airport close by is the Eastern Iowa Regional Airport at Cedar Rapids.